Most of this weekend was spent preparing for the Portland Flea but I did manage to to get some great pieces at just one estate sale. 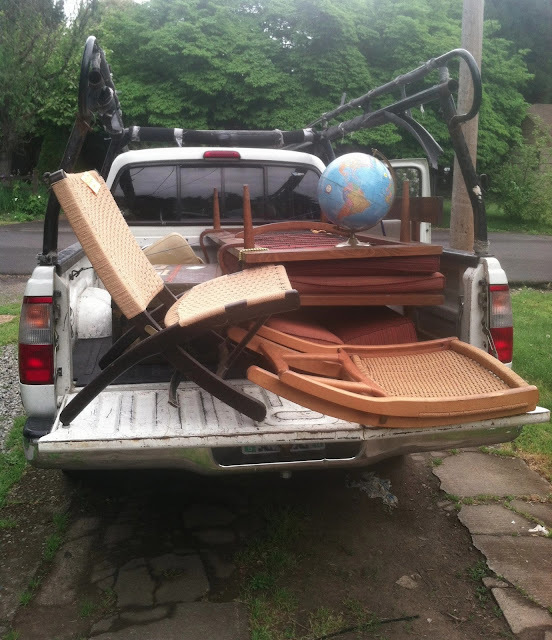 I picked up so many pieces at the estate sale that it took two truckloads to get it all home. The two Hans Wegner style lounge chairs were sold quickly at Portland Flea. I got two of these mid century daybeds. They should be reupholstered by the end of the week. The final piece from the estate sale was this mid century sofa. It is now available at VDC for $750. We had a great day at the Portland Flea and we sold quite a few pieces. The Plycraft chair we upholstered this week is now available at Hawthorne Vintage. I'm glad things went well at the flea! As usual, I love all your finds, especially the lounge chairs. I bet the new owner is super happy with them! Amazing haul as usual! I'm in love with the daybed and can't wait to see what the refinished piece looks like. Egads, what finds! I could totally use that daybed in our guest room/office!